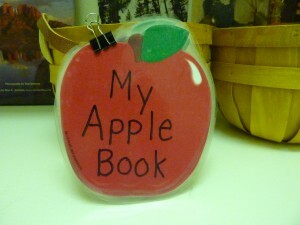 This is a super easy fact book you can make at home to go with almost any theme. It can be made with themed note paper (if you can find it), index cards or just sheets of paper – whatever you have around your house. 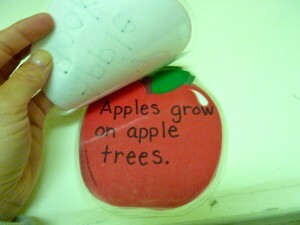 It really is so easy to make something that can build basic literacy skills as well as provide information – in this case, information about apples. I used my apple themed note pad (came in very handy for this theme!!) 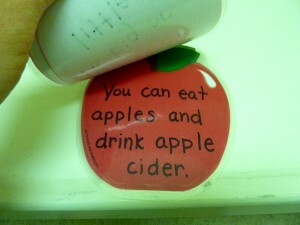 and wrote some basic facts about apples. Nothing fancy but Andrew loved it and even brought in to share with his class! This was made and used when Andrew was 4 so it is very simple but if you look at non-fiction books for that age group, this is what they are – lots of repetition to build word recognition and reading confidence. Note: I used some clear contact paper to “laminate” the pages and clipped them together. I did not want to staple or bind them because I wanted to be able to use them more like cards, even including them as part of a “crawl and get” activity – ex. crawl down and get the next page for us to read.